AC: Complete contains a considerable amount of new footage that the original version lacks, as well as roughly a thousand revised scenes. This adds a total of 26 minutes to the film. 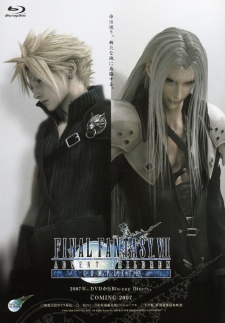 Some of the new scenes include a more in-depth look at the Geostigma, Denzel and Kadaj's origins, as well as an extended fight between Cloud and Sephiroth. The Japanese release of this edition features a new ending track from Kyosuke Himuro called "Safe and Sound", with additional lyrics from My Chemical Romance frontman Gerard Way. The track replaces Himuro's previous track "Calling" from the original cut of the film. However, in the North American release, the song "Calling" remains, and "Safe and Sound" is absent. Can one of the greatest video games of all time break the video game/movie curse?